Over the last three decades, Jubilant Life Sciences has emerged as an integrated Pharmaceutical and Life Sciences Solution Provider offering products & services to its customers across the globe. Range of pharmaceutical offerings for the Indian Pharmaceuticals Market. Sustainability is the investment for the future and it is at the core of our business. Jubilant Life Sciences believes that addressing the challenges of the future rests on the Triple bottom line of Sustainability. The promise of Caring, Sharing, Growing is an integral part of all that we do at Jubilant. There are several initiatives taken for betterment of society as well as our employees. At Jubilant Life Sciences, environment management has gone through various iterations from initially being a mere responsibility issue to eventually transforming into a competency. Our people are our assets and their welfare is our responsibility. The promise of Caring, Sharing, Growing is an integral part of Jubilant Life Sciences. We, with utmost care for the environment, continue to enhance value for our customers and for our shareholders. Welcome to Jubilant Life Sciences - An integrated global pharmaceutical and life sciences company. Welcome to Jubilant Life Sciences, an integrated global pharmaceutical and life sciences company. With utmost care for the environment and society, we continue to enhance value for our customers. Jubilant Life Sciences has been through a wonderful journey with fruitful and long-lasting alliances. With a positive synergy, Jubilant and its Subsidiaries continue to excel in the pharmaceutical domain. Sustainability is the investment for the future. Sustainability is at the core of our business. We understand that long term sustainability can be achieved by reducing environmental footprint and increasing economic as well as community development footprint. Jubilant Life Sciences has also constituted a Sustainability & CSR committee at board level. This committee is responsible for monitoring the progress on triple bottom line parameters (Economic, Environment, and Social parameters). We have deployed dedicated sustainability teams, at our corporate office as well as our manufacturing facilities, for continuous review, monitoring and communication regarding Jubilant’s sustainability performance. At Jubilant Life Sciences, we aim to manufacture products for our customers through optimized utilisation of resources to minimise effect on environment. We also have state-of-the-art environment protection equipment at all our manufacturing facilities, as we are aware of the threats of changing climate. We strive to reduce our carbon footprint through several energy consumption reduction initiatives and by the use of different renewable energy sources. We believe that without a sustainable supply chain base, our vision towards acquiring and maintaining global leadership can never be achieved. With this in mind, Jubilant Life Sciences formulated Green Supply Chain Policy in 2010. At Jubilant Life Science, our people are our assets and their welfare is our responsibility. We respect & encourage talent and in our endeavour to bring out the best in our employees, we adopt policies that are formulated to meet their needs. Our Human Resource department and Ombudsman’s office takes care of the employee/labour relationship issues while the EHS department ensures safe and healthy work environment. Jubilant Life Sciences is a signatory to the CII Code of Conduct on Affirmative Action that reconfirms our commitment to equal employment opportunity for all sections of society. Freedom of Association and Collective Bargaining is respected. We respect the right of our employees to form an association in accordance with the local laws applicable. Child Labour is strictly against our company policy. We have a well-defined grievance identification and redressal mechanism in place for human rights violation cases. Ombudsman office and whistle blower policy sets the basis of employee grievance redressal system. At Jubilant Life Science, we ensure transparency and accountability of our practices. 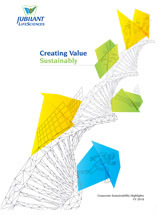 We present our values and disclose our economic, environmental & social performance through our Sustainability Report. Jubilant is a Member of GRI Gold Community of the Global Reporting Initiative (GRI). We published our first Corporate Sustainability Report in the year 2003 in accordance with the Global Reporting Initiative (GRI) Guidelines and are externally assured by Ernst & Young. Jubilant Life Sciences also ensures to report community & social initiatives in line with United National Millennium Development Goals. Jubilant Life Science is one of the few companies in India disclosing GHG emissions in CDP and taking voluntary reduction initiatives. CDP today holds the largest database of primary corporate climate change information in the world. In the year 2010, Jubilant became a member of the UN Global Compact (UNGC) with the aim of internalising the ten Global Compact Principles in the areas of human rights, labour, environment and anti-corruption within the Company’s strategies, policies and operations. Since 2010, we are submitting our communication on Progress (COP) every year and our communications are available at UNGC website. Jubilant Life Science, is a signatory to Responsible Care®, an initiative of global chemical industry that drives continuous improvement in health, safety and environmental (HSE) performance. We submit annual report against Key Performance Indicators (KPI) to Indian Chemical Council (ICC) including our key sustainability performance data. Continuing its commitment to deliver value through safe and sustainable practices, Jubilant Life Sciences (JLL) has received Responsible Care® 14001:2013 certification under the American Chemistry Council’s (ACC) Responsible Care® program for its Corporate Office in Noida and Gajraula Manufacturing Unit.